Cabernet Sauvignon, Cabernet Franc and Merlot vines were transplanted from the historic vineyards in Lispida created by Count Corinaldi. Their fusion renders the wine harmonic and inviting, just as in the best Bordeaux tradition. The vines are 80 years old on the average and provide a reduced quantity of grapes. Hence the name of the wine: “Compendium”, which is a well-known work by the great Italian poet Petrarch, who spent the last seven years of his life in Arquà, where he became fond of farming and wine-making. “Compendium” is a Latin word meaning “weighing it all”, used to refer to the essence, the very synthesis. 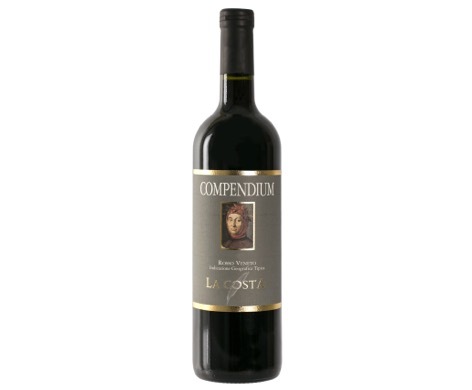 Inspired by the word, the La Costa wine farm decided to produce this excellent wine, in which all top quality characteristics of vinification in the area of Colli Euganei reside. Ripe grapes are manually harvested and placed in wooden boxes. Fermentation takes place in stainless steel vessels and last 15-20 days according to the vintage. After racking off, wine is stored in French oaken barriques (Allier) to refine for about 14-18 months. After decantation, it is filtered, bottled and stored for a couple of months. Long, complex and harmonic wine rich in aromas. It is the perfect essence of the area where it is produced. Enjoy it with red meat and game and with medium ripe cheese.